And well, as soon as I heard that line about the cat burglar I instantly knew that I had to write a book about a girl named Kat who was a burglar. Another huge influence was the fact that I’ve always LOVED con movies—going back to my dad making me watch The Sting when I was a kid all the way up through newer movies like the remakes of Ocean’s 11, The Italian Job, and The Thomas Crowne Affair. That’s when I knew that Kat—who has grown up in this high-stakes world—would want nothing more than to leave that world but she has to get sucked back in to save someone she loves. 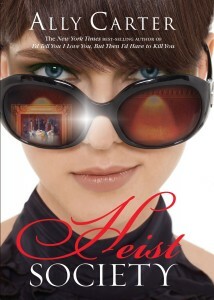 And there you have it—that’s how Heist Society came to be.